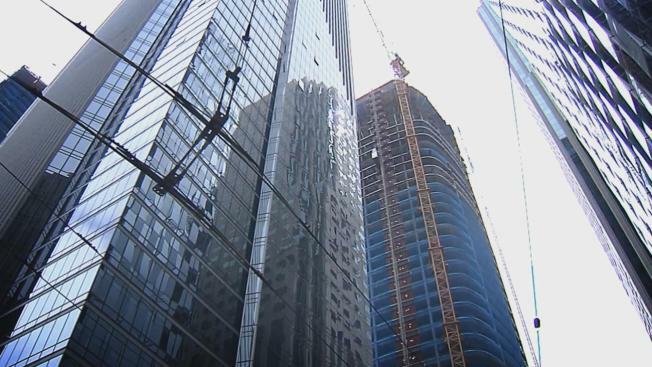 San Francisco building inspection officials created a draft report downplaying risks at the sinking Millennium Tower while other documents show they urged rigorous monitoring and even a citation against the developer, documents obtained by NBC Bay Area show. Peskin was reacting to the latest batch of documents we obtained under our records request this week. One of the document is a draft report that declares the building safe after a secret visit by city building inspection officials on July 20. That visit was before the news broke about the building having sunk 16 inches. The report belies earlier statements by building inspection officials that they did not begin any investigation until mid August. Still other documents suggest that a top engineer with the city, Hanson Tom, told his superior in a July 25 memo that he believed that an unapproved makeshift ramp had been used to span two parts of the sinking building. He said the “steep slope” of a ramp linking two parts of the sinking structure was had not been approved and did not meet city requirements. He also recommended a rigorous protocol of monitoring, especially if the building’s sinking became more dramatic in a year period. His findings were not included in the draft report issued Aug. 4. “It certainly doesn’t assure me at all about the safety of the building,” said Jerry Dodson, an attorney and engineer who lives on the 42nd floor of the building. The Millennium Tower owners association brought in an outside consultant this week who has begun to bore three holes around the building to install monitoring equipment around the sinking and leaning structure. The goal is to measure settlement, water levels and the risk of further leaning. Meanwhile, Peskin introduced a plan to deal with the building inspection department’s document retention policies in light of evident gaps in the record exposed by NBC Bay Area. The city has yet to find, he said, the developer’s response to city concerns about the sinking problem back in 2009. “It is frankly unthinkable that even though the city knew seven years ago that the building was sinking,” he said.